Barbara Mariconda has been writing since the third grade, when her teacher submitted her poetry collection to an educational magazine - resulting in her first rejection letter. The editor urged her: "keep writing and you'll become a published author one day!" And she has – with over thirty books to her credit including an Edgar nominated middle grade, and a picture book that was a National Best Books and Children's Choice finalist and a Moonbeam Award Gold Medal winner. While writing in all genres, Barbara spends most of her time with middle grade and YA, exploring the edges and undercurrents of life that can be sensed and experienced, but never grasped – the stuff of mystery, magic, and spirituality. She is an accomplished pianist and singer, and, as a child, played a mean accordion! She's sung in the Crypt of St. Peter in the Vatican, in a top forty band, and made a recording with Big Bird! An avid traveler, Barbara's ridden a camel in the Sahara, a rickshaw in Tokyo, a hot air balloon over the Valley of the Kings, a dogsled in Alaska, climbed the Great Wall of China, kissed the Blarney Stone, soaked in the waters of Lourdes, and sailed in a gondola in Venice.When she isn't writing or traveling she's teaching teachers around the world to inspire the next generation of authors in their classrooms through her company, Empowering Writers -www.empoweringwriters.com. She has a son and a daughter, both fine artists, working in the fashion industry. Barbara lives in Shelton, CT, with her good-natured shih tzu, Little Man. 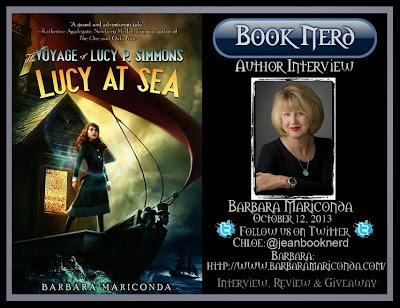 I really enjoyed Lucy at Sea. Will the final book include Aunt Pru? Yes! After making her entrance in book 2 Aunt Pru plays a strong part throughout book 3, titled The Emerald Shore. (If the trilogy ever became a movie I’d love to see Julia Roberts play the part of Pru! Couldn’t you imagine her with her long reddish hair, an wristful of bangle bracelets, khaki jodhpurs, a white billowy blouse, high leather boots, and plenty of attitude? :-) And I have a question for you – if the Lucy series ever became a movie, what young actress might you imagine playing Lucy? Fun to think about! I have read that you write books about writing. Which do you enjoy more: writing books or writing about writing? Interesting question! My first passion is writing fiction, exploring characters, visiting interesting settings and learning about various historical periods. (In fact, part of the fun for me is using travel as a tool to research my settings. For the Lucy Series I camped in Australia’s Outback, and traveled all across Western Ireland to get a feel for Lucy’s world.) I love fantasy and magic, and on the page I can make these things come to life. It’s exciting and fun to allow my imagination free reign, and to be able to express that in a way my readers can share. Another reason I love writing fiction is that various aspects of my life find their way into my stories, and seeing them unfold in fiction always helps me to learn something new about myself and my world. And, honestly, without the experience of writing fiction it would be difficult for me to write about writing. My work as a novelist allows me to speak credibly about the craft of writing, from first-hand experience. I spend lots of time teaching teachers how to teach writing, and my books about writing are designed for them. My goal is to empower teachers to nurture the future authors sitting in their classrooms today. I have a company called Empowering Writers that is dedicated to this goal. I enjoy writing descriptions of clothes from different time periods. What do you think about historical fiction? I love historical fiction. I wasn’t much of a history buff in school – I often found all the facts, figures, and dates a little boring. But, when I experience an historical period through the eyes of a character I care about, I’m suddenly VERY much interested. Internet searches make accessing information and images of different historical periods easy and fun – and fashion is one of the aspects I enjoy as well. I recently completed a book that takes place in the 1930’s in Spain, involving Flamenco dancers and Gypsies. I learned more about the time period through this story than I did in all my years in school! In Lucy at Sea it was fascinating to discover how people traveled across Australia in the early part of the 20th century, how camels were imported from India and Afghanistan to use for transportation, and how there are herds of wild camels in the Outback still today. I actually saw them when I camped there. This is something I never would have learned if not through story. Do you have a college degree? Is it in English or Journalism? I began my career as a musician – I play piano and accordion, and I am a singer. So, my undergraduate degree is a Bachelor of Science in music. I was a music teacher and music director for many years. My Master’s Degree is in communication, and it was there that I began to write in a serious way. I went on to study writing through various workshops and courses. Some of my most influential mentors are Patricia Reilly Giff, Donna Jo Napoli, and Liza Ketchum. Ever since Lucy’s parents drowned at sea, she’s been protected by special magic. That’s why, when Lucy’s greedy uncle Victor tried to steal her house, her father’s treasured “ship on shore” transformed into a real ship, leaving Lucy’s troubles far behind. Now her home is the ocean, and her family is her ragtag crew. Together, they set a course for Australia to find Lucy’s last living relative, Aunt Pru—and answers about the curse that’s said to haunt Lucy’s family. Newbery Honor winner Patricia Reilly Giff called The Voyage of Lucy P. Simmons “a thrilling, magical story with a feisty, unforgettable heroine.” Brimming with seafaring adventure and glittering magic and perfect for readers who love Avi and the American Girl doll books, Lucy at Sea is Barbara Mariconda’s magnificent sequel to The Voyage of Lucy P. Simmons and a book that will leave readers eagerly awaiting the conclusion of the trilogy. It was a dark night when the storm hit. Lucy was asleep in her house overlooking the sea. In a flash the house fell into the sea. A few seconds later the house was a ship! It was magic! Lucy and her nursemaid, Addie, saved her friends Gorgie, Annie, Walter and Marni. Lucy had planned to go to Australia with her aunt and uncle to see how to break a family curse. Now, Lucy sets off on her ship/house to Australia to find Aunt Pru. Aunt Pru is Lucy's only living relative. A long sea trip will follow. Lucy thinks the ship's crew has a traitor in it's midst. During many storms, Lucy persues the traitor. A series of musical notes and a deck of playing cards hold the key to the family curse. The same magic that changed the house into the ship gave the musical notes and cards magic. I really had a hard time putting this book down because of the intricate plot, fantastic details, and how the author twists magic into everything. Thank you Barbara for making this giveaway possible. 1 Winner will receive a Copy of The Voyage of Lucy P. Simmons: Lucy at Sea by Barbara Mariconda. Hi Chloe, thanks for the interview and welcome to your new job at Jean BookNerd, I hope you really enjoy it.